The most influential person in my life passed away this morning, Daniel W. Layne. He was my “grandpa Danny”, my friend, my confidante, my principal, and my pastor. This blog post is written almost mechanically as I currently have no emotions. This post cannot and will not do justice to him, but it is my feeble attempt to remember him. He is in my earliest memories and both my character and personality were influenced by him. Since the day of my birth, he has been in my life. He was the person I could always turn to in time of bewilderment with life or in time of trouble. Each and every time, he guided me along the right paths and it was with great care that he shielded me from negative influences and landmines along my way. He did so much for me and I owe so much to him. This evening the memories still roll on, like a never ending movie. I will forever remember his laughter at my clever response to some antagonist; his smile as he watched me greedily consume his “German chocolate”; his half-amused smirk at my latest escapade which had caused great consternation; his concerned eyes as he listened to my troubles; his pride as I graduated from high school; his concern as he watched me struggle with the world; his disappointment when I told him I was no longer happy; his disbelief when I told him of my plans to leave; and his pain when I told him good-bye and left for the world. For some reason, he would never give up on me. DL: Thinking about you…Keep in touch and if you’re over this way come by. I love you. Me: I’ll do that. I really appreciate your love and all you’ve done for me. I love you too. Somehow the insignificant fact that I thanked him for his invaluable goodness to me and let him know that I (the cold-hearted sinner) loved him, brings me some comfort. Even after I left the church, we still kept in contact. I’d visit him sometimes and we would chat about how different life was on the outside. He encouraged me to go to college and earn a degree to make me more valuable to my employer. He would share anecdotes with me from his experiences in the world, how he left, and how he learned to cope. We would sit on his couches and laugh at how our first drink was so nasty, how awkward our first dates were, how clumsy our first dance with a girl was, how often we simply “played it cool” because we had no idea what was going on. He told me that no matter what I needed his door was always open. He clarified that included friends, problems at work, career changes, girlfriends, or simply anything where I wanted a second opinion. During my childhood my life was great and he played in important part in making that happen. Together we would pore over his Where’s Waldo book looking for the striped little fellow then shout with excitement as we raced to find him first. When I entered my teenage years and problems started arising, he personally took the initiative to get ensure that my teenage years were as easy as possible. 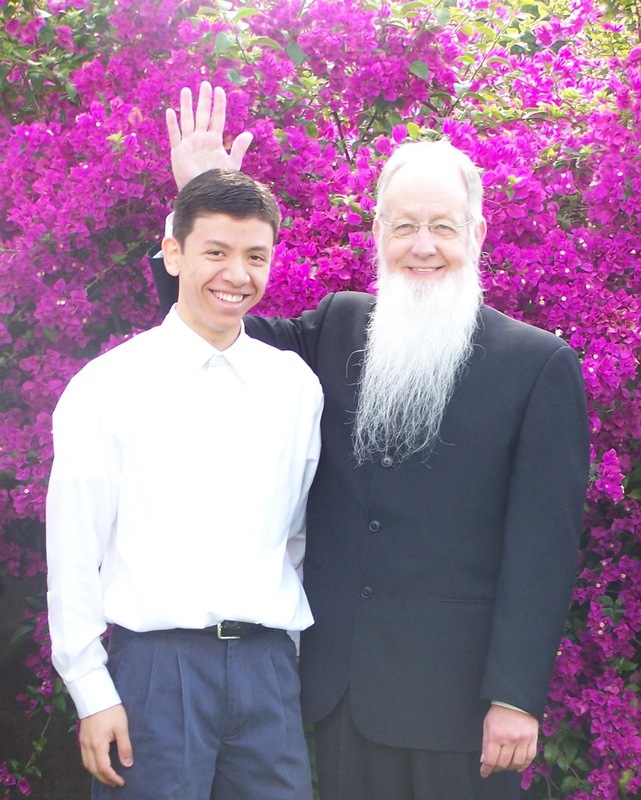 I flew with him to different church meetings, he gave me days off from school to visit the Baja orphanage, he became my travel agent for a 3 month visit to Ontario Canada to give me a break from home. Perhaps most importantly though, he proved to me that he had my best interests at heart and I learned to trust him. Not once did he shake my confidence. There were countless times in my teenage years when I got myself into trouble, but he was right there to defend me and my actions or to point out the mistake that I had made that would have allowed me to avoid trouble altogether. He was my “defense attorney” when my parents couldn’t understand me and somehow he guided me from hating my father to forgiving my father. He opened my eyes to the bright world of classical literature, buying books with his own money for me to read. After reading books such as Charles Dicken’s Great Expectations, we would sit in his living room and discuss the book and talk about the life of Pip. Then he would explain to me how I could learn valuable life lessons from my readings. He taught me to eat with etiquette, to dress to impress, to shake hands firmly, and the art of reading people. He sought to nurture my maturity, intelligence, education, and character. When I entered the workforce (thanks to a recommendation of his), he would often talk to me about how to succeed materialistically, and how to avoid financial pitfalls and career missteps. We often spoke together of my future and he promised to one day marry me to “the best girl there is”. The gap his death leaves in my personal life is enormous and will never be filled. The times I’ve spent with him will never be forgotten. From riding horses with him on the sandy beaches of Rosarito, Mexico, to my receiving a deserved tongue-lashing for my impudence and mischievousness will always be treasured by me. He was the first person that I loved who has died during my life. Even more staggering for me is that fact that he was one of the three people in the world that I whole-heartedly trusted. He was the lifeline that I knew I could turn to if life ever gave up on me, and now he is gone. If I ever was to return to religion, he would have been the one I would have talked to but now religion is a fading coastline. His death was so sudden, so unexpected, and I am still reeling. I never prepared myself for his passing. The sights of this morning are engraved into my memory. Of course I’m composed but it’s because I don’t know how else to be. I’ve allowed his death to process logically and realistically, but I am emotionless with all feelings vacated. There is now simply an emptiness which he once filled. You were my “grandpa Danny”, you kept me from self-destructing, and I will always miss and remember you.